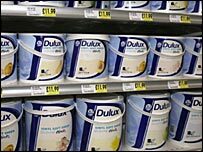 Holland's Akzo Nobel has confirmed that it has completed its £8bn ($15.8bn) takeover of Dulux paintmaker ICI. It said ICI will delist from the London Stock Exchange on Thursday, 3 January, with shareholders receiving 670p per share and a 5p-per-share dividend. The deal was not derailed by the global credit crisis because Akzo has had plenty of cash at its disposal from the sale of its pharmaceutical business. The deal will push Akzo ahead in the $85bn annual global coatings market. The purchase comes eight months after Akzo made its first approach for the British firm last June, and after having had to raise its offer price three times. The deal will see the disappearance of a company that was once a giant of British industry, formed in 1926 by the combination of four UK chemicals companies. At its peak, ICI had interests in a range of sectors from food additives to pharmaceuticals. Akzo, which provided the coatings for the Airbus A380 superjumbo, has had to sell Crown paints to win the backing of the European Commission for the deal. This move came amid fears that a combined group would have too much dominance in the UK paint market. It will now proceed with the sale of ICI's adhesives and electronic materials unit to Germany's Henkel.